What: Sysco truck unloading materials for a local business. Truck in background is another Sysco truck. Comment: Using the Apple panorama feature, I took this photo while crossing Valencia Street, while walking in a straight line and not turning my camera. 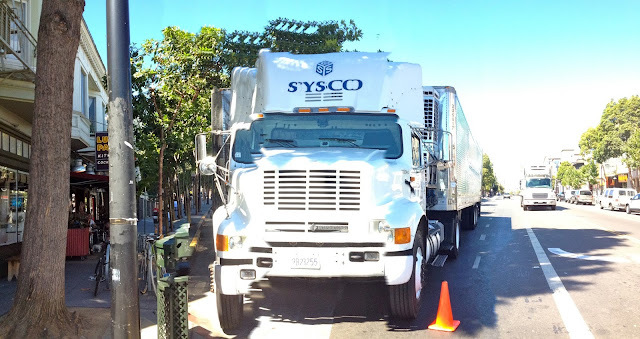 Here's a shot I took just moments before while walking down Valencia Street - it shows the Sysco truck parked in the tiny bit of median (created to allow a left turn lane). Note the man with the hand truck about to unload stuff off the truck. Trucks not blocking the bike lane should be showered with warm, friendly praise!